I decided to modify the sun oven to see what kind of additional power I could generate. Wow! I can't believe it registered 448 degrees this morning at 11:15 am, with a UV index of only 2. I first tried to increase the attack angle of the oven by drilling an extra hole on the bottom of the back tent pole plate, but I wasn't satisfied with the results. I noticed as the days are getting shorter the sun oven is not generating as much heat. I have only been able to cook at about 300 degrees. When I placed the sun oven next to the sport oven I observed that the sport oven had a much steeper maximum winter angle. The only way to achieve this angle is to tip the sun oven so far forward that the tent pole will not touch the ground. After some thought I decided to keep it simple and clamp some small pieces of wood on the front allowing the oven to rest comfortably at that steep angle. This idea worked out great and only takes about 2 minutes to set up. I measured and pieced together the additional reflectors in 8 pieces, 4 rectangles and 4 triangles. I covered them with mirror vinyl and attached them with very small clamps. This only takes about 3-4 minutes. This was how the experiment went this morning with an ambient temperature of only 27 degrees. I started this experiment at 10:20am. The sun oven temperature climbed to 350 in 20 minutes, climbed to 400 in 30 minutes and finally climbed to 448 degrees in about 40 minutes. Wow! that was really fun. It may have gotten even hotter, but I decided it was time to cook some chicken breasts stuffed with broccoli. They came out absolutely awesome. This increased power reduced my cooking time by about 10 minutes. After I opened the oven and put the chicken breasts in, the oven temperature dropped down to, and maintained a cooking temperature of 385 degrees. I included a few pictures for you to enjoy. Let me know what you think. 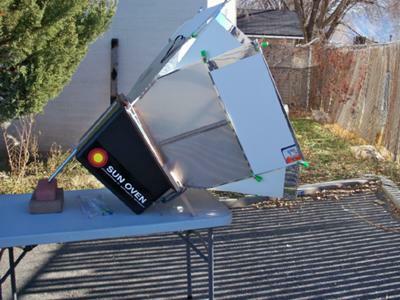 Great write up, and great experimentation for more enhanced solar cooking results. I guess some solar cooks are always looking for ways to improve in every little way they can...that's what I call thinking outside of the box. Winter time cooking does present it's challenges but it is very doable nevertheless. Please share with us detail photos how you went about increasing the temp of solar oven, a step by step guide if poss. I recently saw your picture with the foamboard-covered-with-aluminum-tape inserts. Went to the local hobby shop and bought two large foamboards 20" x 30" and one large foam board. I then cut aluminum foil tape"Shurtape AF 912" which you'll find in the tape area at Lowe's. Runs about $7-8 a roll. Needed a third of a roll to cover the three boards. Placed the large board behind the top reflector, long side running vertical, and then marked the board for bending just after the reflector on each side. I simply dropped the small boards in the side reflector slot, created by the hinge. Brought the three boards together, marked where they would meet, cut off the large board's excess and taped then connected. My insert cost around $9 to make and my sun oven gained over 100F due to the increase in reflective area. I estimate I went from 1320 sq in. to just over 2500 sq in. My oven went to 430F within 30 minutes of morning sun angle, while normally is gets to just over 300F max this time of year. I live in Vegas, so I have no doubt I can go to 500F during the summer, as I've been to 450F before, without the additional surface area of reflecting. Helps to have it 120F outside in August. I think this is a great modification for those who are in Northern latitudes, and want to continue to use their sun ovens year round. BTW, I don't use clips since my version is like a collar and is supported by the sun oven's natural design. Slips right on and right off in seconds. I'll send pictures if you'd like to see it. I'm interested in more information on ways to increase the temp with mods to the "G. sun oven". I've google searched the topic with no results except this brief forum. Anyone have any more links or tips? Wow! 448 degrees with an ambient temperature of 27! I've seen many designs that utilize the additional triangle pieces on the corners and have been curious about how much additional heat could be achieved. I realize that the optimum height of the side panels is dictated by the angle of the reflectors in conjunction with and dimensions of the cooking compartment, but you seem to have mastered that. Since you had to tilt the oven beyond its manufactured limit, were you able to maintain a level cooking surface inside the oven or did you have to make some adjustments? I live in at slightly higher latitude and discovered early on that the tilt angles required are a bit more that what I designed my homemade oven to do. Based upon your ideas maybe the company should provide tilt extensions and make the oven cavity slightly deeper to accommodate those using it at higher latitudes. I?d love to have one of those sun ovens, but simply can?t afford one right now, so I?ll stick with my home made one for now. Great idea you have! So what time do you want us to come over for dinner?? Join in and write your own page! It's easy to do. How? Simply click here to return to Solar Cooking Tips.